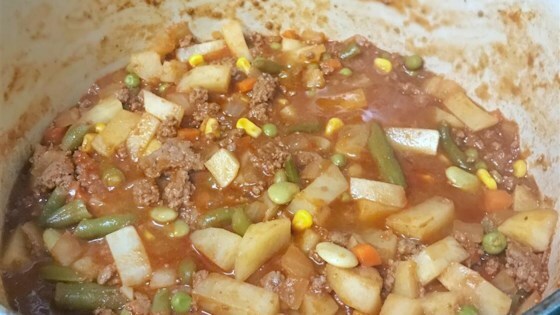 "A very simple and delicious stew that will keep you warm in the winter." Sorry, but this was awful. I hate that I made my kids eat atleast ive bites before, I realized how awful it was. My picky family loved this. I have tried a number of stews with them and this is the only one they ever liked. This recipe is so easy to make and it tastes great. I followed the recipe to a tee and it had great flavor. We make this recipe a lot during those cold winter months. Delicious!! I used about 1 1/2 tsp of salt free garlic herb seasoning and stirred in 4oz cheddar at the end. I could eat this every day.